You've come away on a romantic vacation together and the time seems ripe for a marriage proposal. But maybe the restaurant in your budget hotel just isn't the right place to ask the most important question of your life. Or maybe you're home here the in the UK, but your flat just doesn't seem quite intimate enough. No problem—there are more than enough romantic settings around the United Kingdom to add the hearts and flowers ambiance to your romantic gesture. And while some are grand gestures with grand price tags to match, some of the most romantic of all won't cost you a penny. Choose a romantic restaurant. In 2016, Clos Maggiore near London's Covent Garden once again added the accolade of the Harden's UK Restaurant Survey as London's most romantic restaurant to its collection of other romantic awards. Architectural Digest went even further, naming it The Most Romantic Restaurant in the World in 2016. The Witchery by the Castle in Edinburgh, which also has theatrically Gothick rooms to retire to after dinner. There is something quiveringly romantic about looking down on the whole world together from a very high place. But despite the Sleepless in Seattle image of places like the top of the Empire State Building, most very high viewing spots, like London's Shard or Portsmouth's Spinnaker Tower, are likely to be crowded with other people jostling for a view and poking their cameras over your shoulder. For a really special experience, you could hire a capsule on the London Eye for just the two of you...almost. You do also have to share with a host who pours your champagne. But each capsule is actually big enough for twenty people so the host is no doubt practiced in keeping a discreet distance. The experience is called Cupid's Capsule and includes posh champagne, chocolates, and a rose. As of publication, Cupid's Capsule costs £425. If your budget doesn't stretch that far, try a ride on the Emirates Air Line, London's cable car across the Thames from Greenwich Peninsula to the Royal Docks. 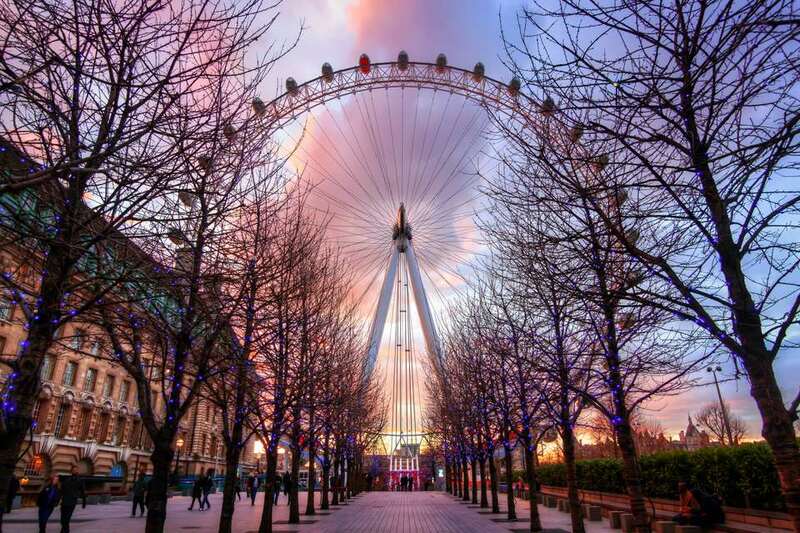 Go in the evening and you'll enjoy a 10-minute ride, 300 feet above the Thames. During the day you'll only have about five minutes to pop the question. You will probably have to share the moment because each car holds eight passengers, but if you go at a slow time of day and hang around for the right moment, you should be able to grab a car just for the two of you. Palladian Bridges, very fashionable garden embellishments of the 18th century, were always designed for romantic trysts - as places to find shelter from prying eyes. There are only four of these lovely, romantic bridges left in the world and three of them are in England (the fourth is in ​St. Petersburg, Russia). If you can wait for warmer weather, you can pop the question after April 14 on the Palladian Bridge at Wilton House, the Wiltshire home of the Earls of Pembroke since 1540. But if you want to make the most of Valentine's Day, head for the beautiful Palladian Bridges at either Prior Park near Bath or Stowe Landscape Garden in Buckinghamshire. Both are owned by the National Trust and the gardens are open to visitors year round. The Lake District inspired the Romantic poets of the 19th century; just think of Wordsworth's field of nodding daffodils. He made his home at Dove Cottage in the English Lakes. Looking for modern inspiration, you could emulate Bill Clinton. He proposed to Hillary beside Ennerdale Water, the westernmost lake in the Lake District. But, if you are thinking of the Clintons, be prepared for a maybe instead of a yes. According to Bill, she turned him down. According to Hillary, she said, "Not yet." All sorts of things have been said about Shakespeare's marriage to older woman Anne Hathaway, possibly in a shotgun wedding. Nevertheless, they were married for 34 years and she bore him three children, two of whom survived into adulthood. He returned to her in Stratford-upon-Avon when he retired from the theatre. When she died, seven years after Shakespeare, she was buried beside him. Her thatched cottage just outside Stratford-upon-Avon, where she was born and raised, is undoubtedly one of the most romantic settings in England. The house itself is bound to be crowded with other visitors, but it is surrounded by a lovely cottage garden. Little benches overlooking the cottage are perfectly placed for a proposal of marriage. Bluebells carpeting a forest floor are a particularly British sight, especially in England and Wales as there are no natural bluebells in Scotland. Fifty percent of the world's bluebells are in the UK. The symbolism of the bluebell is apt for a marriage proposal. The flower stands for constancy and may be the origin of the "something blue" traditionally worn by brides. Bluebells across a forest floor are also a sign of an ancient woodland.